In 2013, Plunkett Cooney celebrated its Centennial anniversary. The following history was assembled as part of the anniversary celebration and is presented here as a tribute to the men and women of Plunkett Cooney and their "Century of Distinctive Service" to their clients and communities. "A Century of Distinctive Service"
Although he did not know it at the time, when Fredrick J. 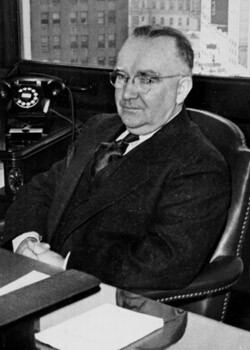 Ward was admitted to the Michigan Bar on July 18, 1913, he effectively launched what is known today as the law firm of Plunkett Cooney. In those early days, he took the freight elevator to his new office at 1117 Dime Bank Building, Detroit, Michigan, because the passenger elevators had not yet been installed. Fred Ward was joined in his legal practice after World War I by Robert E. Plunkett, a graduate of Syracuse University. Robert Plunkett served on the north Russian front as a member of the U.S. Army’s Polar Bear Expedition, so-called because only polar bears could survive the 60 degree below zero weather in which they fought. The firm then became Ward & Plunkett, a name it would retain into the 1950s. An early client, the Royal Indemnity Company insured General Motors. The firm would eventually represent General Motors directly for many years. Other early clients included St. Paul Insurance, Chubb and Sons and Underwriters at Lloyd’s. 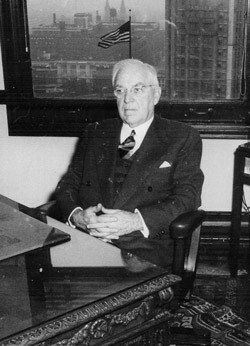 In 1939, William P. Cooney, a graduate of the University of Detroit Law School, joined the firm. He would later become one of U of D’s most distinguished alumni. After serving in the U.S. Navy during World War II, Bill returned to the firm, which would eventually be named Ward, Plunkett & Cooney, with offices located at 1821 Dime Building. Bill Cooney was a recipient of the William Kelly Joyce Award presented annually to outstanding alumni of the University of Detroit Law School. He also served for a number of years as a director of the State Bar of Michigan. Robert Rutt and John Peacock joined the firm after their military service as well. The firm grew from eight members after War World II to 11 members by 1960. During the late 1950s, D. Jerry Watters, Boleslaus (Bill) I. Stanczyk and Edward K. Pedersen, Jr. joined the firm. Fred Ward died in 1966 and that same year the firm moved from the Dime Building to the l0th floor of the Guardian Building. By then, Ward, Plunkett, Cooney, Rutt & Peacock had grown to 22 lawyers. In 1968, the firm opened an office in Oakland County. By 1970, the firm, which was still headquartered in the Guardian Building, had grown to 33 lawyers. Three years later Plunkett, Cooney, Rutt, Watters, Stanczyk & Pedersen had grown to include 49 attorneys. The firm’s growth was fueled by a rapidly diversifying practice. The workers’ compensation department, for example, had expanded from a small staff under the direction of Ed Pedersen to 10 lawyers handling just workers’ compensation matters. In addition, the firm had launched new practice areas, including corporate and tax matters, as well as probate and estate planning. A separate department was created to handle research and appeals with four attorneys initially dedicated to this aspect of the practice. The litigation section of the firm expanded greatly during this period due to a significant increase in professional liability cases being filed against doctors, attorneys, architects, engineers and insurance agents. Developments in Michigan’s product liability law resulted in a surge of new cases being filed. The firm was at the forefront of product liability defense and tried some of the first cases in the nation dealing with claims involving major brands. These assignments included trial counsel for the General Motors Corvair handling cases, emissions cases, motor mount cases and others. This highly active legal landscape resulted in continued growth for the firm. In the mid-1970s, the firm opened a new regional office in Mt. Clemens, Michigan to service its growing roster of clients in and around Macomb County. That office was originally located on Crocker Boulevard and later moved to a more modern facility located at 10 North Gratiot. The firm continued to expand throughout the 1970s, adding numerous associate attorneys and regularly adding partners to its ranks. By 1980, there were 22 partners and the total number of attorneys working at the firm had reached 66. The firm incorporated that same year, changing from a partnership to a professional corporation. At that time, the law firm also entered into the area of municipal law, becoming attorneys for the City of Taylor, Michigan. The firm’s corporate law practice had also expanded to include approximately 10 attorneys under the direction of David P. Ruwart. On a national level, the firm was among the founding members of the American Law Firm Association. The organization, which began in 1980, is now known as ALFA International, the world’s largest legal network comprised of 145-member firms with 85 members in the United States and 60 members in Latin and South America, Canada, Mexico, Europe, Africa, Australia/New Zealand, and throughout Asia. 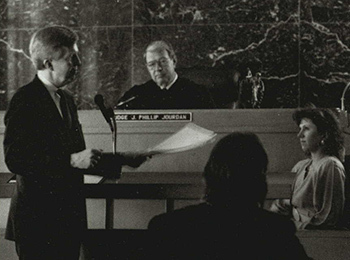 By 1983, the firm had grown to over 80 attorneys, including 33 partners. That same year former U.S. Congressman William Brodhead became a member of the firm and was responsible for leading the firm’s new governmental affairs department, with an office in Georgetown, D.C.
Offices were opened in Flint in 1985 and in Lansing in 1987. A year later, the firm gained a Northern Michigan presence through a merger with the Petoskey based firm of Hoffman, Barney and Gano. The firm, known then simply as Plunkett & Cooney, opened offices in Kalamazoo in 1989, Grand Rapids in 1994, Marquette and Gaylord in 1995 and Ann Arbor in 1999. The firm also began representing a growing numbers of clients in other states, which led the firm to open regional offices in Pittsburgh, Pennsylvania in 1990, Columbus, Ohio in 2001, Indianapolis, Indiana in 2008 and Chicago, Illinois in 2016. Throughout the crucial growth decades of the firm, its attorneys were also engaged in the legal community, most notably through service to the bar. 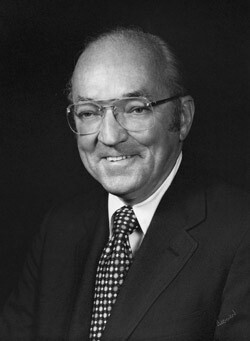 Edmund M. Brady, Jr. served as president of the State Bar of Michigan. John F. Potvin and Peter W. Peacock each served terms as president of the Macomb County Bar Association and William D. Booth served as president of the Oakland County Bar Association. Henry B. Cooney and Patrick O’Leary were elected presidents of the Detroit Metropolitan Bar Association. Firm members have also played key roles in the development of local, state and federal bar association, and they were among the founders of the Michigan Defense Trial Council (MDTC), the American Board of Trial Advocates (ABOTA), the Federation of Defense and Corporate Counsel (FDCC), International Association of Defense Counsel (IADC) and the Defense Research Institute (DRI). From its early years under the direction of Fred Ward, Bob Plunkett and Bill Cooney to present day, the firm has benefited from the steady leadership of its managing partners. Robert E. Rutt, Boleslaus (Bill) I. Stanczyk, William D. Booth and Joseph V. Walker helped steer the firm through its tremendous growth years of the 1960s through the 1990s. Throughout its history, Plunkett Cooney has also been recognized as a leading law firm with respect to legal acumen, leadership, integrity and client service. Among the many honors and awards the firm has won through the years is the coveted AV rating by Martindale-Hubbell, an international legal peer review service. The firm has also been selected by Best Lawyers as one of its top tier firms for client service and American Lawyer Media has bestowed its “Go-To Law Firm” designation upon the firm for several areas of practice. A distinguishing characteristic of Plunkett Cooney has been its continued focus on recruiting and retaining a diverse workforce. In 2002, the firm established a Diversity Committee, which set out to create a 10-point plan for improving internal diversity and increasing the firm’s already solid employee retention rate. The firm’s “Great Place to Work” initiative, diversity training curriculum and formal mentoring program all had their genesis in this committee’s deliberations. As a result, the firm saw double digit percentage increases in the pool of diversity candidates from which to hire. In 2005 and 2008, Multi-Cultural Law magazine named Plunkett Cooney one of its Top Law Firms for Diversity. In 2012, the National Law Journal indicated the firm was among its Top 15 law firms nationally for female diversity among shareholders. Also in 2012, the American Heart Association named the firm a “Fit Friendly” workplace. Based on extremely positive employee feedback, the Detroit Free Press and the Michigan Business & Professional Association recognized the firm’s retention efforts, naming the firm among its “Top Work Places” for several consecutive years. While the firm’s first century of distinctive service has come to pass, the men and women of Plunkett Cooney remain focused on the decades ahead as they strive to build upon the legacy started in 1913 by one man in the unassuming offices of Detroit’s Dime Building.